Daldorado’s SILENTFlow™commercial pool grating system is the next evolution in parallel grating — with features that surpass any other commercial grating currently sold in the US. All grating features the highest flow rate with an unprecedented 40% open area and whisper-quiet noise reduction. 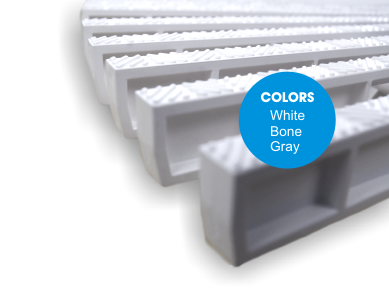 Available in standard 10", 12”, 14” and 16” widths, our parallel grating conforms to both radius and straight configurations. Hand holds and curb angles available for true ledge support (radius or straight). All corners are custom manufactured and strengthened for inside-outside corners per design requirements. Fully warranted by Daldorado. Daldorado’s SILENTFlow™ parallel grating has been engineered to make installation so easy you will want to install it on all your pools. No more expansion issues or buckling. Added truss support combined with using the highest quality materials allows for superior strength unmatched by any other grating company (excess of 4,000 lbs). Complies with the International Child Finger/Toe Entrapment Guidelines featuring a gap opening of only 8mm.